Tea tree oil comes from the leaves of the tea tree, scientifically known as the Melaleuca alternifolia, a tree native to Australia. Some people use tea tree oil on their skin as a method of treating bacterial and fungal infections, or they add the oil to warm bathwater to help congestion and coughs. If you get tea tree oil in your eyes, you may experience serious side effects that could affect your vision. In most instances, eye contact with tea tree oil will not cause blindness. If tea tree oil comes in contact with your eye, you may experience redness, surface irritation and discomfort. The inflammation and discomfort may result in minor changes in vision, and your vision should return to normal as the reaction clears. A severe allergic reaction to tea tree oil may affect the cornea, which is the clear, dome-shaped tissue that covers the central, front surface of your eye. A corneal reaction may result in some inflammation of the corneal tissues, and this may cause some clouding that could disrupt vision. If your eyes come in contact with tea tree oil, you should thoroughly flush your eyes with water to help prevent irritation or other symptoms. 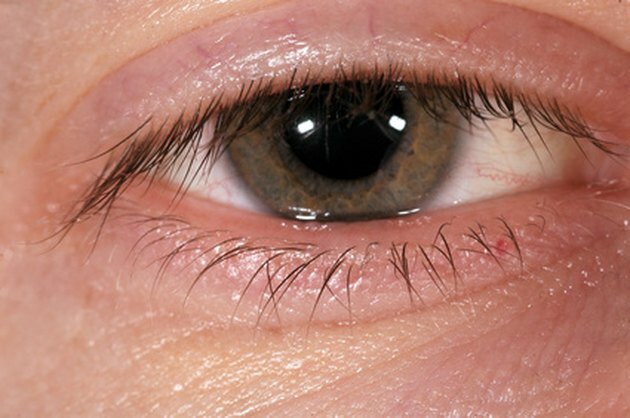 You can flush your eyes two different ways, but, you should perform the eye flush for at least 20 minutes. One way is to stand in the shower and let warm water run into your eyes. You can point the shower head at your forehead and let the water run down to your eyes. Try to keep your eyes open as much as possible. If you prefer, you can put your head under a sink faucet and let warm water run from your temple into your eyes. You may need to periodically change sides to let water run into the other eye. Contact lens wearers should remove their lenses if tea tree oil came in contact with their eyes. You should talk with your eye doctor about the appropriate way to clean the oil from your contacts or if you should insert a new pair of lenses. To avoid eye contact with tea tree oil, wash your hands after using the oil. Vision changes after contact with tea tree oil or other substances require immediate evaluation from your eye doctor. Corneal inflammation may require prescription medications to help resolve the condition and restore your vision. In some cases, sudden changes in vision may not result from contact with this substance but may indicate a serious eye condition. What Are the Dangers of Patchouli Oil?